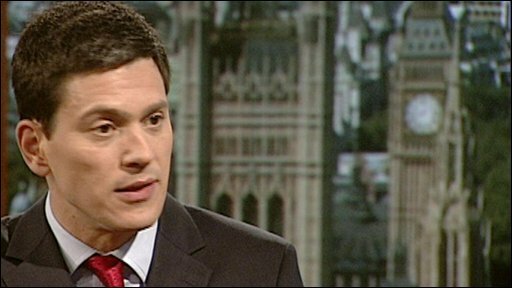 David Miliband has said there is no question of "bulldozing" Ireland into voting again on the EU Treaty - but Britain will continue to ratify it. The foreign secretary said it was right to "respect" the Irish decision - but also right to "take our own decision". He said it was for the Irish PM to decide on his next move and whether to "apply the last rites" to the treaty. Without the support of all 27 EU states it cannot become law. The Tories say Britain should vote on the treaty. Mr Miliband told BBC One's Andrew Marr Show: "There is no question of bulldozing, or bamboozling or ignoring the Irish vote. "We have got to wait for the Irish government to decide what they're going to do next." "The rules are absolutely clear, if all 27 countries do not pass the Lisbon Treaty it cannot pass into law." But he said the EU (Amendment) Bill, which ratifies the Treaty in the UK Parliament, should continue through the Lords. "Our decision must be for us, according the Parliamentary rules that we hold dear." Asked whether he accepted that the treaty is dead, he said it was for the Irish PM to decide on his next move: "If you like he's got to decide whether or not to apply the last rites. We've got to listen to his analysis of what went wrong." Mr Miliband said "one option" was to carry on with the old rules, without the treaty, which was designed to help the EU cope with its expansion into eastern Europe. He said a "two tier" Europe, with some countries pressing ahead with greater integration and others being left behind was not something that was "in our interests or going to happen". He added: "It's a bit messy at the moment, but let's work our way through it." But shadow foreign secretary William Hague told BBC One's The Politics Show: "The only point in other countries continuing to ratify the treaty is to put pressure on the Irish, to bully the Irish - a kind of preparatory move to saying to the Irish: 'You're going to have to vote again on this'." He said: "Let's treat this as a wake-up call and stop this centralising agenda and abandon this treaty." Earlier Liberal Democrat leader Nick Clegg, who supports the treaty, said it was now "highly unlikely" that it would ever be implemented. "We should not just somehow airbrush out of history the Irish vote. I really hope that the European elites won't behave with the arrogance that a lot of people think they should," he told The Andrew Marr Show.